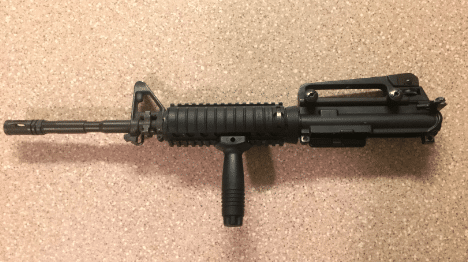 Home Colt M4: The Best AR-15 in .22LR? 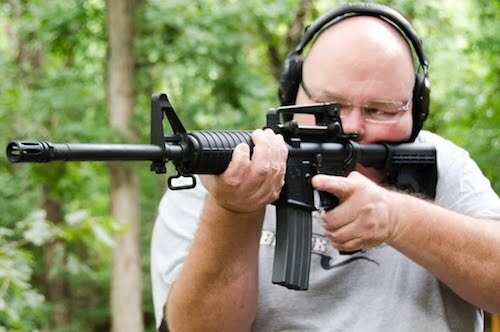 Colt M4: The Best AR-15 in .22LR? I grew up with a deep love for the classic look of blued steel and wood stock! This was back in the “good old days” when guns looked regal, even artistic. Even the wear and tear of many years of use just melted into the beauty of the firearm. I’ve worn out my fair share of these classic looking rifles with scuffs and dings, and have fond memories of all of them. These days I do tend to carry the modern “space gun” style, with lightweight polymer stock, stainless steel barrel, and customized to the heart’s delight. But when it comes to just having some run or the occasional critter problem, I reach for my AR-15-style .22 LR. I was looking around in a local gun store and I saw some AR-15s up on the wall all in .22 caliber. Then one catches my eye, a “Genuine Colt”. I ask to take a look at it and I notice the Colt logo is printed in big bold print. The lower reads, “made by Walther”. Keep reading to see my take on the Colt M4 .22 LR and some other AR-15’s in .22 LR. As soon as I grabbed it, I noticed that it is all metal. Unlike my only previous experience with the .22 AR S&W M&P 15 which was constructed from a light polymer. A short time later I walked out with the rifle, a few extra magazines, and two boxes of Federal Automatch. I had been looking into drop-in .22 uppers and conversion kits for my AR-15 but never found anything I would be comfortable putting on my gun. I wanted a firearm that was purpose-built to use the cheaper ammo while maintaining the same mechanics as my .223 AR. Colt, along with Smith and Wesson, released their versions of AR platforms chambered in .22 during 2009. Like I mentioned earlier I went with the Colt M4 Carbine produced by Walther. This firearm looks amazing, and dare I say is one of the “cooler” guns in my lineup. 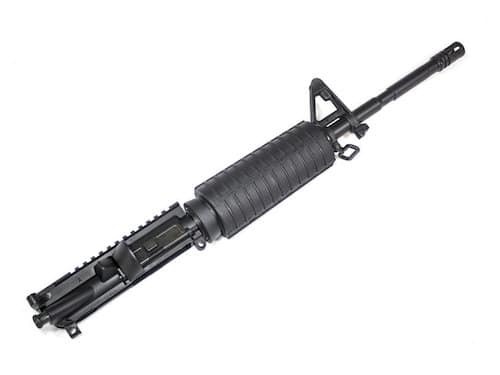 Equipped with a 16” Parkerized M4 style barrel with a flash hider and all aluminum upper/lower. The sights are metal and adjustable, and just in case you’re the kind of person that like to mount a bayonet there is a lug available. The forend is clean of any slots or rails for mounting add-ons. The stock is the common AR 5-position locking slide. The handle with the rear sight aperture is removable, revealing the flat –top Picatinny rail for mounting improved sights. Although the .22 LR has all the controls as the .223 and 5.56 they don’t all function, for a reason. For example, the forward assist button moves exactly the same but affects nothing on the rifle. This keeps the feel as close as possible to the larger caliber ARs making it an effective trainer gun. Like the bolt release near the magazine well, it too is non functioning as this firearm’s bolt is closed only with the charging handle. The factory trigger isn’t great, but it gets the job done. When I hooked it up to my trigger scale I got just over 8lbs as an average. It also has a long almost free sweep and then gets noticeably stiff just before the fire point. It doesn’t make the tightest groups even from a steady bench, but that’s inherent with all M4 Carbines. The upside to the heavy trigger is a quick and pronounced reset, allowing for faster follow up shots as you train with the firearm. Most AR’s tear down using the rear pin to pivot the upper off of the lower, then taking the charging handle and bolt carrier out. But the M4 .22 Carbine only requires the charging handle to be taken out for cleaning. The top of the “bolt” has a hex screw that is used to tweak the bolt speed, allowing you to make adjustments to better suit your ammo. Personally, I have never had a need to fiddle with this setting, and with all the ammo I have run through my M4 .22 LR I have never had a problem. Currently, magazines come in 10, 20, and 30 round varieties. However, the 30-round magazine is awkward to use from a bench as it is rather tall. It got to be so cumbersome that I started priming the gun, then removing the mag completely so I could aim off my bags. If you plan on using this rifle to hunt for small game, be sure to follow all laws and regulations regarding ammo limits BEFORE you go out! This rifle is just a blast to shoot, pun intended and can go through an entire box of .22 LR in a flash. It’s no accident that my Rock River AR is still factory, as it is such I well-rounded firearm that it really doesn’t need anything else. This leaves less to foul up if I ever truly need my rifle to defend hearth and home. The same goes for the .22 Carbine, it is great just the way it was made. But for the sake of trying everything once, I attached an old Weaver optic that was just sitting on the bench to the .22 LR and headed for the range. With a target at 50 yards, I gave it a shot. At first, I couldn’t get a decent sized group, but once I removed the magazine the rifle tightened right up. Once I got it narrowed down, the average group size was 1 3/8”, with one exceptional set measuring only 7/16”! I was using Federal Automatch .22 LR ammo for the test. Without any optics, I was able to get an average group size of 1 ¼” at 50 yards. I’m sure that with some trial and error a better round could be found for the rifle and those rings made smaller. Then I did some close quarters practice by bringing the targets to 10 yards. I set up two silhouettes and decided to run the pattern of 2 to the head, 2 to the chest, then transition to the other target to repeat. The training was amazing and I got progressively faster and more accurate, finally culminating in an overall 3” spread at both target locations across both targets. All told I was impressed with the rifle as well as myself. After several boxes of ammo, and letting friends and family try it out, I haven’t had any issues or failures. Right out of the box this rifle is rather accurate! However, I think that installing a better trigger and attaching better optics would increase precision greatly. That said the iron sights are not too shabby once they are adjusted properly. 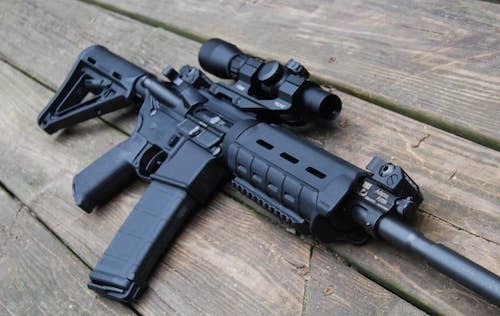 This is after all still an AR style firearm, so it is designed to feel natural and secure. The weight is more akin to the larger calibers so it makes a great stand-in training weapon. What can I say, the factory ARs look darn good! Simple lines and that standard flat black spray coating show that this rifle is ready to put in serious work. If the factory design seems lacking, fear not because this rifle is just as upgradeable as any other AR. Want more rail space? Change out the forend and add lights and lasers, add a grip for better control, whatever the heart desires. The rifle only cost between $275-400 and mags are around $30 apiece. That mixed with the low cost of .22 LR ammo makes this a big plus. Colt’s M4 .22 Carbine is an amazing training firearm for those new to the AR platform and seasoned veterans alike. It is so much fun to go out and rip through a box of ammo with this thing. Also debuting in 2009, the Smith and Wesson M&P 15-22 is another fine example for an AR in the .22 LR caliber. With all the choices in from factory options, there are officially 15 variations of this rifle on the market. Smith & Wesson quickly found success with .22 rifles that used the same triggers and break down style as the .223 models. The big difference here is the material of the upper and lower, not aluminum like the Colt, but lightweight yet durable polymer, making the rifle weigh in at only 4lbs 13oz. The controls on the M&P 15-22 pretty much match up to all other ARs, so it’s a snap to pick it up and know where to push to get things done. Currently, there are 10 and 25-round magazines available. In addition to the polymer build, the S&W M&P 15-22’s comes stock with a 6-position buttstock, Magpul MBUS folding sights and MLOCK forends. This opens a lot of choices when it comes to picking a sight, adding lights and lasers, or putting a grip out front. You most likely know CMMG for their uppers and conversion kits, or for their highly popular MkW-15 Anvil Rifle. But they also make a top-notch .22 LR firearm. 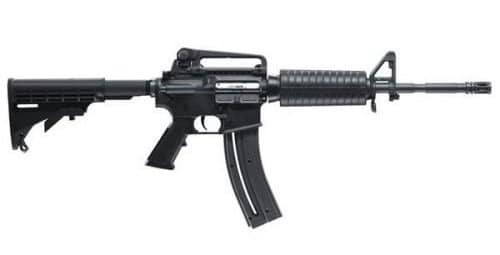 This is another typical M4, weighing roughly 6.2lbs, sporting a 16” barrel, forged upper and lower, 6-position stock, and MBUS folding rear sight. Magazine capacity currently comes in at 10 and 25-rounds. There is clearly a pattern, as the AR-15s in .22 LR are following the same path as their larger bore predecessors in that they mostly all share standard features and feel relatively similar in the hand. The biggest differences are still price and quality, like with all firearms. If you are considering converting your AR-15 instead of getting a new rifle then check out this .22 LR conversion option from CMMG. 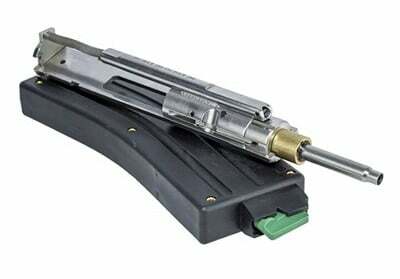 CMMG’s Bravo kit comes with a stainless steel bolt carrier and a 25-round mag to get you going. Brownells has these kits for sale often, so be sure to keep your eye out for deals… Or you can scoop it up right now at this link. Installing the kit is a snap, replace your regular bolt with the one provided, pop in the magazine, and you are ready to enjoy. Yes, it is that simple! The Bravo kit is a great way to switch your current AR-15 to .22 LR while not breaking the bank making it an ideal option for the financially prudent shooter. This replacement upper is identical to the one on the full Mk4LE rifle, except it is missing the rear sight. 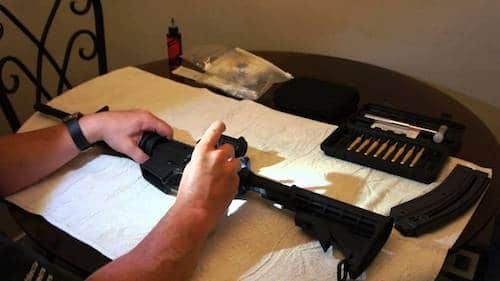 Once again installing this kit is as simple as switching out the upper by tearing the rifle down as though you were cleaning it. Rebuild with the new upper, load it up and enjoy. Having a complete upper made specifically for the .22LR bullet makes a difference in accuracy because the barrel is designed for that ammo. To account for slight variants, a barrel meant for a .223 bullet is bored out to .224” where the barrel for a .22 LR is only .223” in diameter. This can lead to issues when you only change your bolt because of the barrel width and twist rate. But a barrel made with the proper bore and twist to fire .22 LR will not lose any potential spin or velocity due to a bad fit! Personally, I am extremely happy with my Colt M4 .22 LR. Honestly, I will most likely add it to the list of rifles that I wear out from constant joyous use! If you were on the fence about getting a new .22 LR rifle of conversion kit then I hope this has shown you what options are out there. Next time you are looking for a fun gun for the range, give an AR-15 .22 LR a try and I’m sure you won’t be disappointed. How about you? Would or do you keep a .22 LR around to train with? Let us hear about it below in the comments!